Grab some birthday cake and a party hat because Old Hollywood Films will be celebrating the 100th birthday of Olivia de Havilland next month. 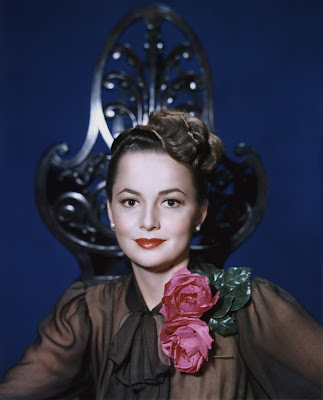 * Ms. de Havilland will be 100 years young on Friday, so I'll continue my 1001 classic movie series every Monday (except July 4) with a look at three of de Havilland's best films: the swashbuckler The Adventures of Robin Hood (1938), the psychological drama The Snake Pit (1948), and the Southern Gothic horror film, Hush . . . Hush Sweet Charlotte (1964). *I'll have a TCM star of the month guide for de Havilland on Friday, and I'll review de Havilland's great performance in Light in the Piazza (1962) on Saturday for the Olivia de Havilland Centenary Blogathon. Plus, I'll have a series on the gowns of Gone With the Wind (1939) each Wednesday. *I'll also celebrate Olivia's career on social media. You can follow me on Tumblr, Google+ or Pinterest or like Old Hollywood Film's page on Facebook. Follow me on Twitter @oldhollywood21. *First, I'll take a look at the never completed 1937 version of I, Claudius for the Sword & Sandal Blogathon on July 8-10. *I'll review Warner Bros. social realism drama I Am a Fugitive From a Chain Gang for Hot & Bothered: The Films of 1932 blogathon on July 9-10. *I'll celebrate the genius of special effects artist Ray Harryhausen with a review of The 7th Voyage of Sinbad (1958) for the Ray Harryhausen Blogathon on July 10-15. *Finally, I'll celebrate Joan Crawford's legendary career with a review of Mannequin (1938) for The Joan Crawford Blogathon on July 28-30.